The Shetland Sheepdog, commonly called the "Sheltie", can be traced back to the Border Collies that were brought to the island of Shetland and crossed with the native dogs there. The crosses were then brought to England where they were crossed with the Rough Collie and other collies. The original Sheltie was used as a farm dog that protected the herds and flocks as well as a companion dog to their owners. The Sheltie was recognized in England in 1909 and by the AKC in 1911. Today the breed is a popular companion dog as well as an excellent competition dog due to their high intelligence and energy. The Shetland Sheepdog was originally called the Shetland Collie but the name upset Rough Collie breeders at the time. 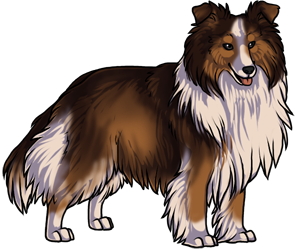 The dam of the first AKC Sheltie champion was a purebred rough collie. The original Shelties were spitz-type dogs.